The domain and theories of marketing have been expanding since the origins of the discipline. Since the 1970s marketing science has been organized around the exchange paradigm. Marketing concepts apply to all forms of exchange, whether it is goods, services, personages, places or ideas, and whether it is between individuals, for-profit and nonprofit firms, governments and NGOs. Marketing theories evolved from a firm oriented view to encompass the exchanging dyad. More recently the paradigm expanded to a network level of explanation, and relational theories have come to the fore. But even as the field struggles to grasp its new fields of explanation, there is a Kuhnian shift happening at its boundaries. The shift significantly bends the marketing worldview as well as the theoretical tools and methodologies we use to study it. 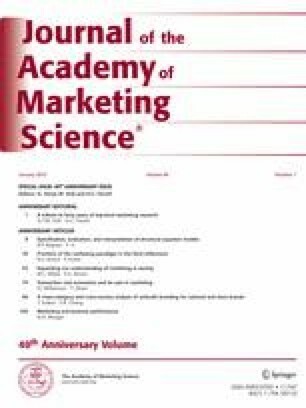 In this paper we develop a three-tiered explanation of the emerging field of marketing—its subphenomena (consumer experiences and sensory systems), its phenomena (marketing networks), and its superphenomena (sustainability and development). Bonsor, K. (2007). How nanotechnology will work. science.howstuffworks.com, July 9, 2007. LA Times (2006). The lingering reek of smell-o-vision. April 13, 2006, latimes.com .